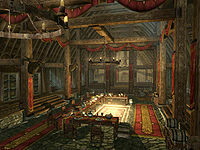 Jorrvaskr is the mead hall headquarters of the Companions. It is located up the stairs from the central plaza in Whiterun. It was founded around the Skyforge before Whiterun even existed. The city itself built up around it. The entire building is an overturned Viking-style ship. 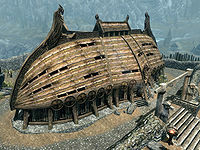 According to the book Songs of the Return, Vol 7, Jorrvaskr was the name of one of the ships that sailed from Atmora under the command of Ysgramor. The crew carried the ship across land and made it their shelter when its captain, Jeek of the River, founded the Great City. It consists of two zones, Jorrvaskr and Jorrvaskr Living Quarters. Animal Extermination: Fulfill a contract given to the Companions to kill an invading beast. Animal Extermination: Fulfill a contract given to the Companions to clear out a beast den. Hired Muscle: Fulfill a contract for the Companions to bring a citizen back in line. Trouble in Skyrim: Fulfill a contract for the Companions to clear out a troublesome area. Retrieval: Journey to a random location to retrieve a fragment of Wuuthrad. Stealing Plans: Search a Silver Hand hideout for information on the location of their headquarters. Striking the Heart: Assassinate a leader of the Silver Hand. The main hall is where the Companions meet for meals and relaxing between training and missions. It consists of one large 'horseshoe' shaped table around a fire; there are only nine chairs, which is less than the total number of Companions. On both the east and west sides of the hall, there are two sets of double doors, above which can be seen four shields. On the south side of the hall is the main weapon display area. The fragments of Wuuthrad, several of which are missing, are placed in the middle of the wall, above which are two shields which are inaccessible. On the pillars of the stairs are four weapon plaques, three with greatswords and the other with a warhammer, none of which can be taken. To the side walls are two weapon racks, one on either side, and these weapons can be taken. On an end table facing the fire, is the Heavy Armor skill book Hallgerd's Tale. All the items here are free to take after completing Take Up Arms. On the north side of the hall is a separate bedroom belonging to Vignar Gray-Mane, where Brill sleeps as well. There are two unusable beds in here, as well as some high-value potions, two silver ingots, and a mammoth tusk. Nothing in this room is free to take at any time. This area is where most Companions sleep, and it mainly consists of beds. To the southwest is where the lower-ranking Companions and Tilma the Haggard sleep; there are eight usable beds (rested bonus only). To the west are Aela the Huntress and Skjor's bedrooms. Aela's is on the south, and has one unusable bed, an expert-locked display case with a leveled bow, and the Archery skill book The Marksmanship Lesson. On the bookshelves are four ice wraith teeth, and there are some pelts on the table. To the north is Skjor's bedroom, which has one unusable bed and an expert-locked display case with a steel dagger. There is a batch of fire salts on the shelves by the bed and three silver ingots on the shelves by the door. To the east is Vilkas' bedroom. Vilkas' bedroom has one unusable bed. There is the rare book Lycanthropic Legends of Skyrim and one sample of ice wraith teeth on the shelves by the bed, nine chaurus eggs on the end table by the door, and some high-value potions on the stand on the other side of the door. The bar contains one unusable bed used by Farkas, a lute, and unsurprisingly, a large amount of mead. The items in Aela's bedroom are only free to take through marriage; the items in Vilkas' and Skjor's bedrooms, and around the bar, are never free to take. The items in the hall and the communal bedroom are free to take after completing Take Up Arms. The Harbinger's quarters consists of a bedroom and a study. The study contains four display cases, three of which are locked by expert locks; the other is located atop a set of shelves, and is not locked. The three locked cases display a dagger, a warhammer, and a greatsword (all leveled). The unlocked display case is empty. On the map table is a giant's toe and the Two-handed skill book Song Of Hrormir; on the end table beside that table is a daedra heart. The bedroom contains one unusable bed and an unusual gem. All ingredients respawn. Everything here, including the bed, becomes free to take after completing Glory of the Dead. There is a "Danger" shadowmark on the right hand pillar ascending the stairs to the front door. The Companions have a low view of thieves and will not hesitate to kill you if you are caught stealing. They will, however, be lenient if you are a member of the Guild, but you must still pay a fine to them. There is at least one safe container inside Jorrvaskr. It's a chest behind the wooden railing on the right side of the hall area when entered from the main doors. Jorrvaskr's doors lock during the Battle for Whiterun quest. The locks cannot be picked, and any members or quest items inside are inaccessible. The doors unlock sometime before the end of the following quest, Rescue from Fort Neugrad, or Reunification of Skyrim if you have sided with the Imperials. When you complete a Companions job and want to enter Jorrvaskr to finish the quest, the map marker will actually point you to the back doors. However, the Shield Sibling who gave you the quest will be standing closer to, and even facing, the front doors, fully expecting you to enter through them instead. One or more of the Companions inside or behind Jorrvaskr may attack you on sight for no apparent reason. They will not accept your yield, and may not be killable due to being tagged as essential. ? Commit a minor crime, such as assault, in front of a Whiterun guard, then clear your bounty. This should end their hostility immediately, even if they are in the middle of attacking you. In Jorrvaskr Living Quarters, when you first enter the area you see 2 sets of shelves if you Whirlwind Sprint (only tested with tempest level) it takes you off the map and resets you at the door. This page was last modified on 16 February 2018, at 18:20.